Autoclave? 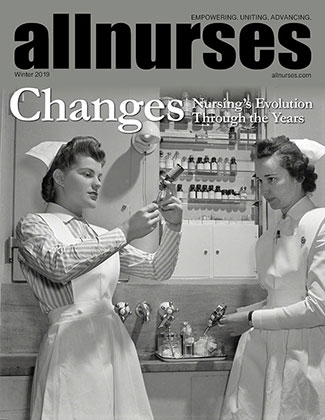 Since we are discussing the old days, important to mention nurses staffed/ran central sterile supply and did the autoclaving and so forth. Notice in the 1970's clip it is a nurse offering the "laughing gas" to the woman in labor. Now for the COB query: how many recall using a fetal stethoscope or Pinard horn? Ahh, good ole Sani-White. Known and loved (or hated) by nurses and or mothers of toddlers for ages. If you wore these: Or these: Or maybe these: Then you used this: Guess there is a point to "starched whites" being sort of high maintenance. On your days off at least one probably was fully devoted to washing (and maybe ironing) your uniforms (if the hospital didn't), polishing duty shoes and washing (with perhaps starching and ironing) your cap. Original nurses "uniform" from Florence Nightingale's time onwards was based on that of servants/maids. That is some sort of dress made from a plain patterned but sturdy material (checks, stripes, etc...) and an apron/pinafore. Everyone who did any sort of work wore aprons back then to keep clothing clean. Laundry being a several day long affair (if the article of clothing could be washed at all, no dry cleaning so wool and silk would be a problem), you can imagine mothers and anyone else was wanting to keep clothing clean long as possible. In hospital/providing healthcare aprons functioned the same as they did elsewhere, they kept your clothing clean. For some however they also represented servitude (again maids), but you still needed to keep your clothing clean. Gradually at least in the USA by WWI white became the color associated with "trained" nurses uniforms. The advent of washing machines (even if only in commercial laundries) meant clothing was easier to be cleaned and could be done so in less than a day. Thus gradually graduate nurses began to shift out of pinafores/aprons (which many hated anyway because yes, they were often starched to death and not very comfortable), but sadly student nurse uniforms often kept some version of the two piece dress and pinafore or bib really until rather recently. Many of the old hospital diploma three year programs had different uniforms to indicate the grade of nurse. Things varied but usually broke down to first year being "probationary", then second and third year. You can see in this picture from the old New York's Roosevelt Hospital school of nursing the hierarchy. First year probbies are down in front (plain uniform without a cap), second and third year students follow on the next tiers (lighter color uniform, pinafore and cap) and graduate nurses/instructors (starched whites and cap) on the top rows. Keep in mind that nursing uniforms (including students) often closely followed the fashions of the period. Right though the 1950's leaving aside a few eras such as the "Flapper" of 1920's any female past puberty would have had some rather restrictive undergarments. Girdles, corsets, suspender belts, etc...., as such the dress either by design or adaption fitted what was underneath. Many of the old student and graduate nurse dresses were rather shapeless. They had to be first because it made laundering and ironing (by hand or machine) easier, but as with all clothing back then things didn't come in many sizes. You got something that fit a range (small, medium and large basically), and you adjusted things to fit by buttons, tapes, hooks, etc... Thus it wasn't always the dress that had a small waist, but you could make your apron tighter which held everything together. Long story short by the 1960's less restrictive female fashions were taking hold everywhere and that included student nurse uniforms. Sleeves got shorter, many places ditched aprons/pinafores in favor of one piece dresses, and by the 1970's pants became an option. Where aprons or whatever did still exist they likely were more comfortable (not starched). Giving a shout out and credit where it is due. The young student nurse pictured above is a Miss. Susan Petty of Lebanon, Pennsylvania who arrived in NYC to attend Columbia Presbyterian Hospital school of nursing. With WWII raging on there was a push to recruit young women into nursing. The influx of students allowed graduate nurses (as they were then called) to be freed up for military duty. Picture shown above drawing meds was taken at the "Babies Hospital of New York", which was at first a private institution but then became part of Columbia-Presbyterian Hospital. It is now called the "Morgan Stanley Children's Hospital". http://maecatt.tumblr.com/post/123075626502/coolchicksfromhistory-susan-petty-trainee-nurse# A whole series of pictures of both nurse trainees and other education of women for the war effort were taken by the same photographer and now reside in the Library of Congress. Am guessing these were "PR" images distributed to newspapers, magazines and so forth to drum up the war effort. Photogrammar Susan Petty O'LAUGHLIN sadly passed away in 2014 but lead a rich and rewarding life it seems. I for one thank her for her service to not only the nursing profession but her country. Susan O'LAUGHLIN Obituary - West Palm Beach, FL | The Palm Beach Post P.S. How did one suss all this out? Started with the uniform and cap which one recognized (I would, wouldn't I? ), as belonging to the old Columbia Presbyterian Hospital school of nursing here in NYC. Celebrating a Half Century | School of Nursing Columbia merged their school with the university and long since closed their much admired and respected undergraduate program. Last time one checked even their dual BSN/MSN degree is gone and they now focus entirely on post graduate nursing degrees. LPNs? What do they do? Where can they work? Difference between LPN vs RN? With all this push for making $15/hr. the new minimum wage (here in NY it could happen any day now), am wondering if acute care and other settings where LPs were pushed out will be brought back in lieu of aides and other UAPs. By and large LPNs were phased out of NYC acute care hospitals years ago IIRC. *Think* some places still hire them but they work in other parts of the healthcare network, not necessarily on the floors. Nursing assistants represented by union (usually 1199) here make around $17/hr. so am told. However those with no such connections can and often do make less. Am wondering if there is a point at which hospitals will find that if they must pay more it will prompt changes in job requirements/description that means going with someone who has a license. Despite New York State's participation in the ACA and roll out of its own insurance exchange ER's in City and elsewhere are still crowded. Persons continue to use them as a substitute for PCP and it is causing all sorts of problems including staffing related issues. ERs in critical condition, nurses say; patients cite long waits | SILive.com Leaving aside the question of insurance (or lack thereof) and finding someone to accept there is the problem of physicians keeping "banker's hours". After a certain time of day or on weekends/holidays you often will be hard pressed to get in touch with or see a PCP. The "ER" Lenox Hill opened at the former St. Vincent's campus is 24/7 IIRC, but not everyone lives near or wants to trek down to the West Village. My PCP hasn't accepted insurance since been going which is >25 years. You either pay by cash or check and they will fill out your insurance forms for reimbursement. Here in NYC that has been the standard for many private practice physicians and has been so for some time. Of course those connected with networks or hospital run facilities are a different story. As for why they all give pretty much the same response; the cost of employing staff to deal with insurance companies and or Medicare/Medicaid. They just don't want the bother. Here in NYC urgent care centers like CityMd vary, that place takes all sorts of insurance including Medicare and Tricare (but not Medicaid IIRC), also is in network for a good number of private plans. Not sure if this has been covered or not but compensation for nurses is largely a factor of COL in a particular area. New grads start here in NYC at mid $70K to low $80K per year. Now most anywhere else in the USA that would be "big money", but not so much in New York. High housing, taxes and other costs mean that $80K does not go as far as you might think. High housing costs are a huge problem for hospitals in NYC especially Manhattan. With rents for a small studio apartment on average >$1500 per month (and that won't be in a good building/nice area) to >$2K (better area and building) you can see where this is going. Sloane Kettering is building housing on Roosevelt Island, and IIRC NYP has a few buildings scattered around Manhattan including a new one on Second Avenue. Not sure if Mount Sinai still offers nurse housing. Still off of those efforts are drops in the bucket with nurses stressing they need higher wages to deal with this local economy. Nurses along with physicians and other licensed professionals are at least at the "top of the food chain" so to speak, and thus fare better than UAPs, techs, administrative, and so forth. There depending upon the facility wages can be "decent" to "good" but often no where near what they need to be considered a liveable wage. The head of NS-LIJ was interviewed as part of a news program about young Long Islanders fleeing after college because they cannot afford to remain. The man's point of view was NS-LIJ cannot fill and retain employees for such positions at what it considers very good wages. Now the compensation offered may very well be "good" in the eyes of that network, but considering the COL in LI and NYC some have other ideas. Anyone affected by the storm and or on duty that day with war stories? Has been almost three years and is still my *favourite* (if that is the proper word) example of a medication error and the actions that followed that took the gold for running, standing and jumping. Nurse's suicide highlights twin tragedies of errors - Health - Health care | NBC News We shall never know the full story behind the situation surrounding nurse Kimberly Hiatt. But that a well seasoned nurse with nearly a quarter century of experience under her belt could been treated so badly by her hospital, and apparently the state BON and or everyone else in the profession in that area speaks volumes. Even worse that this same experienced nurse chose to end her life rather than deal with what she saw as the real prospect of being never able to practice again also speaks volumes.